We are starting the month, so here is my update on how my little balcony garden has done lately. With the arrival of November the weather has changed noticeably. The days have shortened quite a bit (the sun sets around 4:30pm). Also, the stormy days are gone, no more wind or rain for some time. And, while it feels more chilly in the morning, there is still enough sun and the average temperature remains perfect for sprouting some last minute crops, getting some nice blooms and just letting all the plants grow nicely and prepare for winter. One new thing I have done is I sowed a bunch of new lettuce, komatsuna and chives in starting pots. I will have them growing there for a while and then transplant them to the big vegetables planter. To help them sprout, I made an attempt of building a coldframe. I put together a tray, a fabric bag/box and some sticks. Hopefully the fabric will be enough to keep the heat inside. Also, like I had mentioned before, I wanted to get a red rose to have more flowers and to keep my cliché levels high enough. Well, I did. It is still a stub so no flowers until next year, but it seems pretty healthy so far. I will talk more about it on a later post. The latest strawberries seem to be doing well (fingers crossed for not jinxing it). I have six varieties now, one of them must make it. For now most of them are scattered around several little planters, but I think I will eventually put some on their old one. I already wash with scalding water and scrub it well, hopefully that will be enough to keep whatever strange thing that happened to the others at bay, but i will still take precautions. The herbs are doing great! All of them are growing well. I think this is the most prolific part of the garden right now. I just love how the mix of scents gets into the room every time I water them, or also, at night if the window is open enough. The old lettuce pot is still overflowing with green, even when I have been going at them knife first every time I can. They are still more than half full and they have grown so much that they got all tangled. Of course I have learned my lesson, Don't overcrowd seeds. I will thin down the other planter before it gets to that level, which will be soon by how they are growing. The flowers are great! I turn the planter around every couple of days so they get even sun. The maple and the grape show no sign of dropping their leaves or even turning color anytime soon. I guess they still have plenty of sun and not enough cold. I shall wait a bit more. The flowers keep on growing well, and blooming nicely. I hope they make it until end of December. Oh, and even the red geranium is getting new flowers, he made a nice recovery from being so pale, I think he liked the company. All the rest of the plants are doing pretty well. 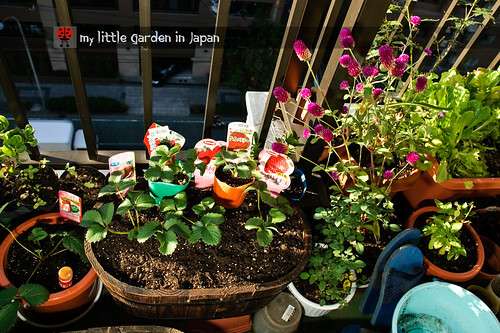 It seems like this days my little garden in japan is a very happy garden. how is your garden doing lately? Everything looks great - can you leave your geraniums out over winter - they wouldn't make it here! Like you it is getting dark by 4:30 but unlike you last night was howling wind and rain. I am amazed at your lush balcony garden. 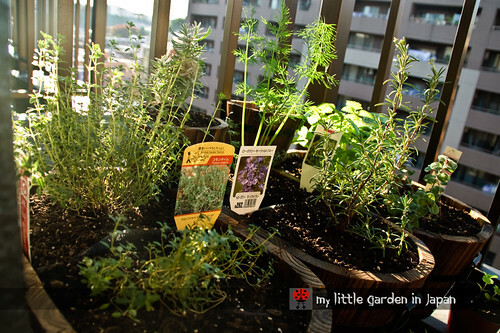 You have made the most of your little tiny garden. All your plants look very happy and healthy! Fer I'm just amazed at how much you've fit into your little garden! It's delightful and I thoroughly enjoyed the tour! Was that gomphrena with the purple button blooms? I've planted some and am hoping it will bloom before the first frost so I can collect the seeds. Funny how many plants we have in common even though miles and miles apart! 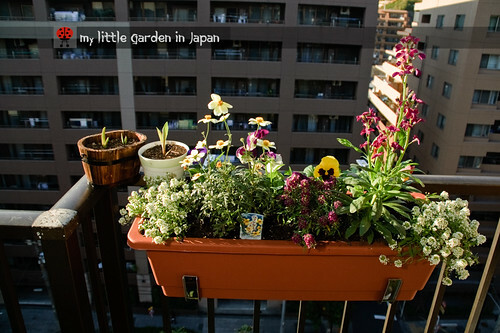 You've fit quite a garden into your balcony. Having lived in a highrise in Central Europe, I can imagine the enjoyment you get out of your little green oasis. I hope they all do great, I just have to keep a good check on them. But, it is becoming quite a jungle out there, I have hardly any space to walk any more. Not that I regret it tho, the only complain is that I don't have more space to get more. GLA~ Here it doesn't get so cold in the winter, so geraniums can make it outside, I only have to make sure they don't get to much snow on them. TWG~ Yes that is gomphrena. Is a great flower, It is very hardy and the blooming season last so long, also I love that purple color. Everything looks great. Glad to see that your strawberries are doing well this time round. Wow! What a beautiful garden indeed! Everything is really pretty especially the planter. You have a good mix in there. Great taste! Hi Fer; about the chilli plants on my blog -- YOU are the expert on these things, not me, so if you reckon they are Chile de Arbol, then I'll take your word for it! They have not been as spicy as I had hoped, but they look nice. I'm back home now, and would appreciate the opportunity to get your advice on tortillas. Can you please tell me where to find your email address? Thanks. Mark. 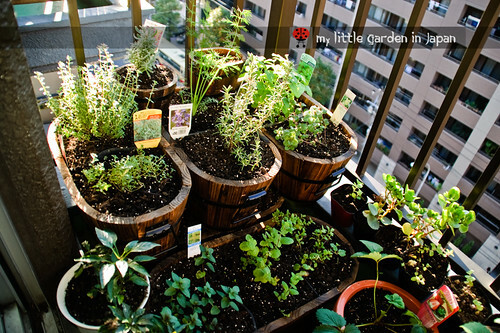 Wow you have many collection of herbs in your balcony. Looks like you can thin your komatsuna and prepare a dish with it. We finished harvest our komatsuna this week and I am thinking whether I should sow another round of komatsuna for this season or not. I hope the strawberries do well, and the vegetables I already started their harvesting, today I had a nice salad with the lettuce, the komatsuna and some basil. I like how you go 'vertical'to get more plants in a small space. Are there any empty walls which you can use? Geraniums are such great plants. They never fail! 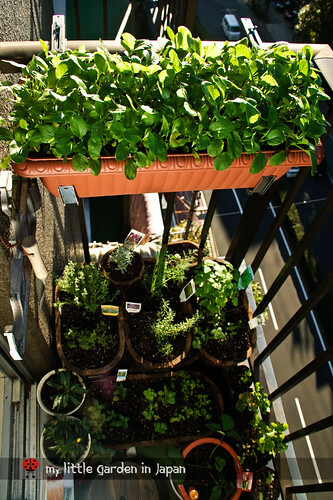 I wonder how many more plants you can put on your balcony. When I just had a balcony there were plants everywhere...hanging and on steps make for more good stuff. Also right inside the glass door were shelves with plants. Gotta love gardening!! It's great to have variety of flowers and vegetables in your balcony. I know what a typical balcony of apartment buildings in Japan is like since I used to live in an housing complex in Kyoto. Your balcony is not so large, I think. Hi fer..you make the most of a small balcony! 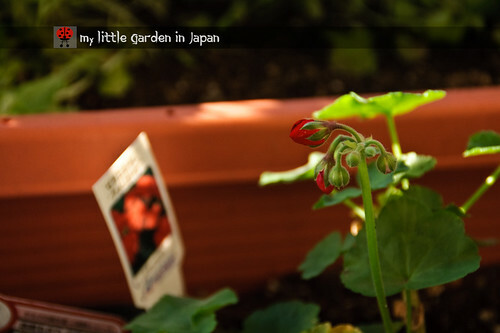 That shows size does not matter but your preserverance and passion for gardening overcome the small space with different varieties of plants and flowers. Your constanct loving care make the plants healthy and happy! Happy gardening! 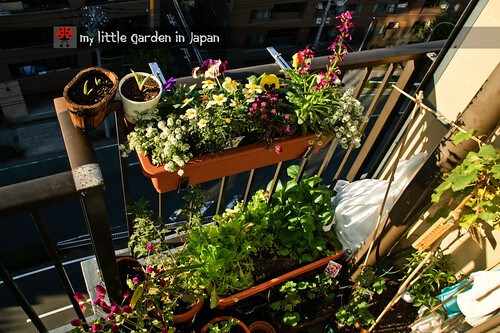 I am very possibly going to move back to Tokyo next year, I hope the balcony that I get there will have some more space for new plants. I still want some blueberries and I will need more space for vegetables too. Tatyana I don't have any more walls to use, but I might use what is left of the rail. Fer you have used your balcony space very efficiently. You really can get a lot of produce out of a small space. Thanks for stopping by Keewee's Garden. 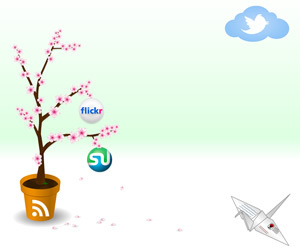 More flowers for blooming day! The seeds sprouted, the coldbag works!